Hollywood was a magnet for musicians in the decade of the 1930s. Developments in the new art of sound-film moved quickly; in the world-wide Depression the film industry was rolling in money, constantly developing new technologies and attracting new creative talent. Then, in 1933, came the expulsion of Europe’s Jewish, modernistic, or otherwise subversive musicians by a dictator whose ideas about music were a particularly strong part of his monomania. Composers fleeing Hitler from not only Germany (where their music was banned immediately in 1933) but from other countries falling under Nazi dominance, came together in the fascinating and often frustrating atmosphere of Hollywood, where music was too often treated with disdain. The question for each European composer who worked in the film industry was how to retrieve his own soul after selling it. How would he be able to return to composing the music he felt was inhim to write “for himself”? 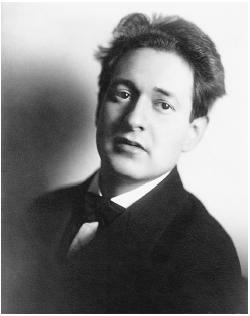 The Viennese composer Erich Wolfgang Korngold was recognized for his remarkable musical gifts when he was a child by Richard Strauss and Gustav Mahler. Forced as a prodigy by his formidable father, music critic Julius Korngold, young Korngold was an internationally acclaimed composer of operas from the age of 18. In Hollywood in 1934, for an assignment at the request of Max Reinhardt, the famous Austrian theater producer and director, Korngold took to film scoring as if he were composing opera and later said so: “Just as I do for the operatic stage, I try to invent for the motion picture dramatically melodious music with symphonic development and variation of the themes.” Although he had no previous experience in this field, so keen were Korngold’s dramatic ideas that Reinhardt declared, “If he were not the great musician that he is, he would become a great dramaturg.” The Warner Brothers studio paid Korngold more than any other film composer, allowed him fewer assignments, and gave him the extraordinary privilege of asking producers for changes in their film footage. His name appeared as prominently in the screen credits as the film director’s name. His film fans became so numerous they formed clubs. Korngold’s trips to Hollywood from Austria were annual from 1934 until March 1938. He was composing his Oscar-winning score for The Adventures of Robin Hood with Erroll Flynn, when the Anschluss took his homeland and everything that belonged to him and his family. He and his wife were instant refugees, desperately trying to bring their families to the United States and safety. They became citizens, and Korngold remained in California for the rest of his life, supporting his and his wife’s families by his film work. From the beginning of World War II Korngold suffered a deep depression. The String Quartet No. 3 was the first work he wrote “for himself” since 1937 and his last chamber work. It was sketched in 1944, as he watched the lights of night shift aircraft workers’ cars streaming over the Cahuenga Pass from Los Angeles to the Lockheed aircraft factory in North Hollywood, and exclaimed to his wife, “This will be Hitler’s end!” The work was completed in 1945, the year his dominating father died, and portrays the freeing of Korngold’s spirit. The first movement is in sonata allegro form; its two themes are opposed in nature. The first theme descends chromatically; the second theme ascends by small steps, hesitantly. The effect of this opening is somewhat tentative and puzzling. (The melancholy Austrian émigré composer, Ernst Toch, living nearby in Santa Monica, often used similar musical language in his concert works of the same period.) As these two themes are developed their intervals become more extreme; the ascending second theme, which had started out in small intervals, attempts a fourth upward, then an octave. “Avanti!” (“Go for it! !”) Korngold writes in the score amidst the octaves. But the first theme’s descending intervals are also growing larger and more distorted. Resolution of the atonal conflict is only achieved at the end of the movement in a comforting soft D major chord, the first real indication of the home key. The second movement is a Scherzo, scintillating in rhythm and string technique in its portrayal of the sparkling car lights and Korngold’s hope for Hitler’s end. Its form is ABA, and the middle or Trio section uses a melody from the just completed film Between Two Worlds, the music of which Korngold favored above all the film music he composed. The slow third movement uses the love theme from the 1941 film, The Sea Wolf . The modal theme is built on ascending fourths, which had served significantly, since the works of his early rise to youthful success, in Korngold’s “Motto of the Cheerful Heart.” Here the theme is subjected to variations, some of them ghoulish. In the final movement, an allegro con fuoco seems at first to pay tribute to Korngold’s Hollywood neighbor, Stravinsky. Its fiery vitality gradually evolves into a jolly second theme Korngold later used in the 1946 film Devotion, about the Brontë sisters. Just at the end of the movement the descending theme of the first movement is briefly recalled, as well as its distorted ascending reversal, and the quartet ends in a strongly tonal and irrepressibly jubilant mood. Note: This article is excerpted by the author from program notes on Korngold for the BardFestival, Oct. 2005. Dorothy Crawford, musicologist, is author of Evenings on and off the Roof: Pioneering Concerts in Los Angeles, 1939-1971 and Expressionism in Twentieth-Century Music (with her husband, John C. Crawford). Her latest book, Hitler’s Gift to American Music: Émigrés and Exiles in Southern California, will be published by the Yale University Press in Spring 2009.